The monarch places this coat o airms on a mantle gules lined wi Ermine. Abuin the mantle is a pavilion gules again topped wi the ryal croun. In the Ryal decree it is statit that the male successors can replace the croun on the shield bi a helm wi the crest o Nassau. 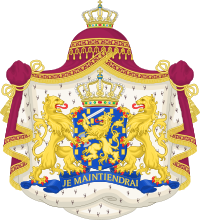 Wikimedia Commons haes media relatit tae Coats of arms of the Netherlands. This page wis last eeditit on 6 Februar 2018, at 21:40.